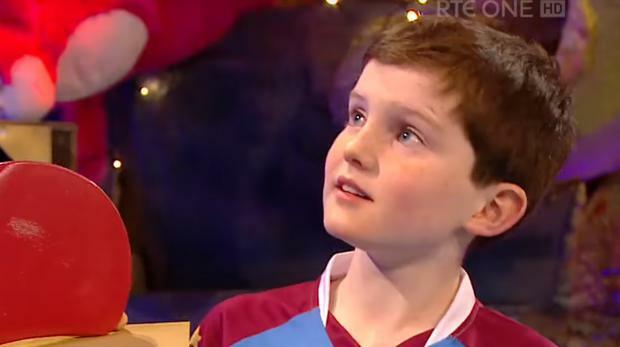 The nine-year-old from Oranmore endeared himself to the audience with his love of the All-Ireland hurling champions. From building a replica of Croke Park on Minecraft and going through Joe Canning's epic winning point in this year's semi-final win over Tipperary to honing his skills on a hurling rebound net so one day he can don the maroon and white, Daniel proved himself to be mad about Micheal Donoghue's side. Just when it seemed like his segment was wrapping up, Ryan sprung a surprise when Galway captain David Burke and four of his teammates emerged with a whole host of special gifts for Daniel. Daniel's reaction after learning he will train with the Galway team in January was priceless.